Do you see what I see in these astonishing aeromagnetic maps? There are some really interesting things discovered in magnetic maps of the Finnish Geospatial Survey. These maps are of extremely good quality and... well, look at yourself. You see a male creature with fangs? I do. I see also tools around his head. The tool on the right is similar to tools, which "ancient astronauts", painted in Val Camonica, Italy, carry in their hands. There are also many other creatures, like this with a saber-like beard. "Bedrock" (or these creatures) is from the Orosirian Period, according to the NLS information. Re: Do you see what I see in these astonishing aeromagnetic maps? What do these maps represent? I mean, does darker correspond to higher magnetic field strength or weaker? I don´t know exactly, but in many cases for example some metallic (like REE, energy and ferrous metals) areas are very dark. It is very interesting, that there are not only jewelry and tools in these sites, but also bags, giant bags, like this one, but this is from another place. It´s just impossible to think, that a rope of the bag would be just a "natural formation", among other things. 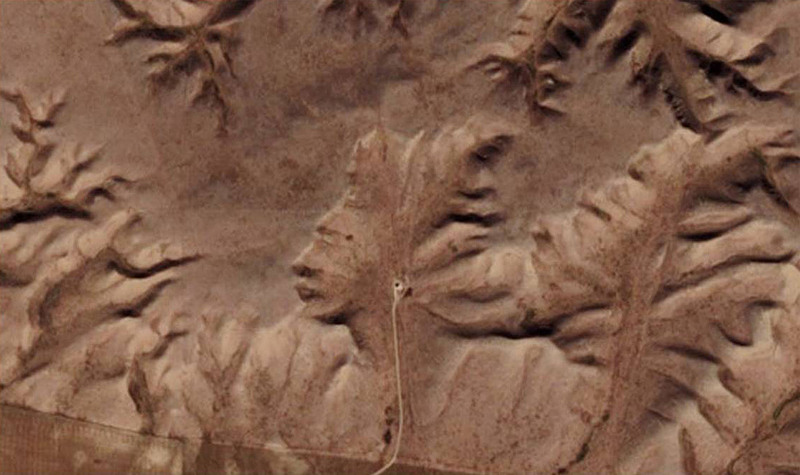 This is kind of geo- archaeology or gigantology and it´s hard to ignore clear evidences. To answer the question of your title, no I don't. If I indulge my imagination I can see various shapes, animate and inanimate in each of your examples. This is a reflection of the human ability to extract patterns from visual data. It is a vital survival trait, allowing our ancestors, for example to spot predators (or hostile fellow humans) in tall grasses, or forests. It has proved useful too in modern society for all kinds of formal and informal analysis. Yet is has a downside. Our brains will also identify patterns where none exist, or misinterpret random patterns that coincidentally match this or that image. That's why one reads reports of the face of Jesus appearing in mold, on the side of a building. In short, none what you think you are seeing is real, but is instead the product of brain well versed in pattern recognition, but not immune to errors. Welcome to the human race. The images are (magnetic) patterns frozen in what was once molten material. It´s not just random faces somewhere, but also objects and in some cases whole bodies, which are quite similar to human bodies. For example, there are even humerus, elbow and finger bones just where they "have to be", in one c. 50 km long body. It´s not just a mere coincidence and mind creating patterns, but reality. We have learned that there were not giants or other developed alien life forms, thus it´s easy and comfortable to negate everything. However, there are more details about these beings presented here in a Youtube- video Alien Burial Site. It says a lot about this sort of thing that, when I saw the image above I thought "he's going to go on about it being a picture of a crouched human.". I was rather surprised when you described this as showing a bag. So, the answer is very clearly no, I don't see what you do. I think there are symbols, writing or some marks in the supposed bag. One P-like letter and other drawing. However, it´s hard to ignore a saber-like beard attached to the face seen in another picture. Everyone can see, that a tail/ saber/ whatever is not just random petrified mud. So where are the equivalent google images? Any longitude and latitude references? All these public maps can be found at Finnish NLS website. For those of us who don't speak Finnish, could you go and find out where these pictures are? A location or a set of latitude + longitude or something like that. I don't see any of them, except the bag, and I'm not impressed with the bag. I must agree that this is nothing more than pareidolia. then to choose "karttatasot" (map levels) on the list on the left. Then choose "geologia" and from there " Aeromagneettiset matalalentomittaukset". For some reason I cannot get the image imbedded here. This particular site is in Southern Finland. How do patches of high and low pressure, as seen on weather maps, form? Are galaxy distribution maps correct for right now? How can we recognize dried-up rivers on maps? Page created in 0.221 seconds with 74 queries.